Bali ATV Ride and Spa Tour is double adventure programs that we make so that you can enjoy the two activities in one day, enjoying the riding atv bike for 2 hours with through tracks full of challenges and ends with enjoying the spa for 2 hours to make weight you come back well after an exhausting activity. The first adventure we started with a bicycle trail through tracks provided and will certainly make your holiday in Bali full impression. The tracks are impassable during the ATV is through the woods, along the river and crossing the road near the rice fields. After the ATV adventure is complete, you will enjoy a lunch that was provided while the menu is Indonesian food. After lunch our driver will drive to the spa to continue adventure enjoy both the spa for 2 hours, after completion of our driver spa will be between Bali to the hotel with a memorable memories for program and Spa Bali ATV Ride Tour. Enjoy a holiday in Bali with atv bike ride for 2 hours and along the tracks provided while passing through a challenge on the track. Something experience not easily forgotten, it will always be a memorable experience in the heart. 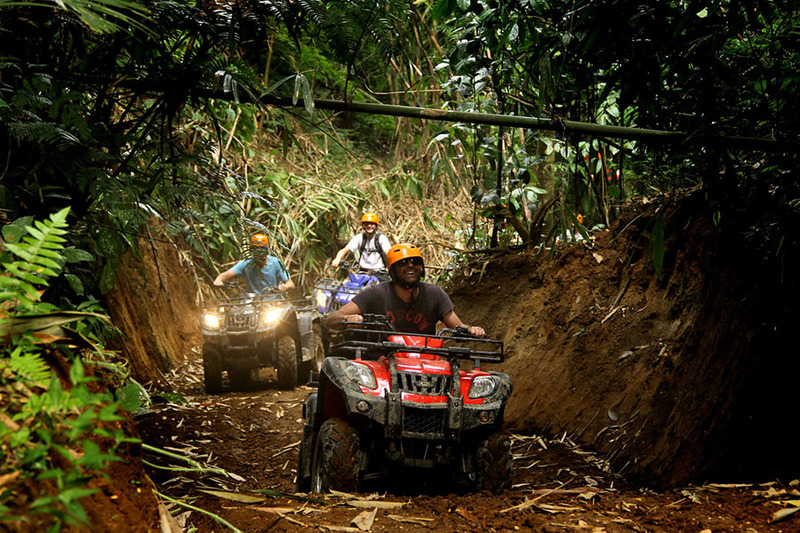 In this adventure you will pass through the forest, river and rice paddy and ATV guided by an experienced guide.